After 40 years, the bass created specifically for Bill Wyman by Vox has been reissued in very limited numbers. 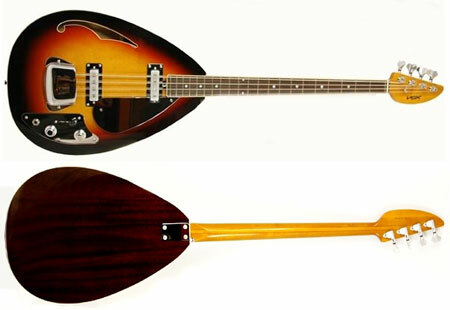 The Vox Teardrop VBW-2000 has been recreated in almost every detail, with the same styling and the same unique parts. That means a semi acoustic body, a craved maple top with three-colour sunburst and a back and sides made from a natural finished mahogany. There’s also a short 30.5-inch length, a very slim neck, a custom bridge with chrome cover, chrome knobs and scratch plate and to fit that custom spec, a fitted hard case. Only six will be available in the UK (and not many more elsewhere), with a price of £1,599. Follow the link to buy one of the UK’s few. 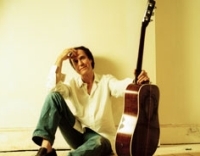 Former Kinks frontman Ray Davies has written a musical about growing up in post-war London. Davies composed 20 new songs for the production, which he is also set to narrate when it hits the stage later this year. Come Dancing focuses on the vibrant London ballroom scene of the 1950s. 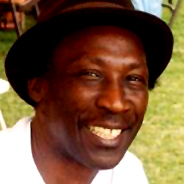 As a youth, Davies said he used to watch his sisters go to the capital’s ballrooms and dances every Saturday night. He would later write The Kinks song ‘Come Dancing’ about his eldest sister Rosie. Davies has been planning the musical for almost a decade. The musical is directed by Kerry Michael, who recently took the helm of the theatre production of The Harder They Come. Come Dancing opens at the Theatre Royal Stratford East in London on September 13. See here for more information. If you happen to be planning a late season break in Blackpool, you might want to check out The Wrong Box. 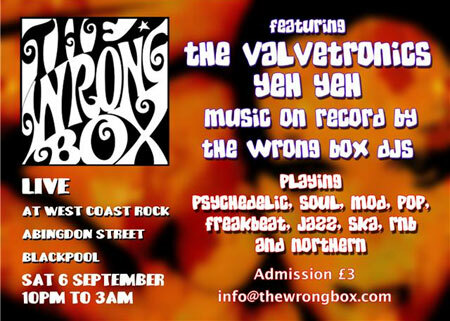 Taking place at West Coast Rock, Abingdon Street, Blackpool on Saturday 6th September, you’ll get a couple of live bands (The Valvetronics and Yeh Yeh), followed by the resident DJs playing vintage sounds – everything from soul to psych. Admission is £3 on the door and if you want to know more, email [email protected]. 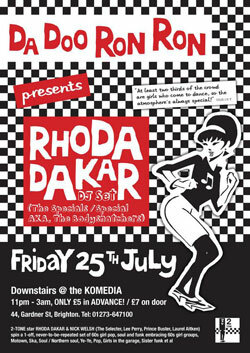 Brighton’s long-running 60s girl group night Da Doo Ron Ron is having a special guest DJ – Rhoda Dakar (Special AKA / The Specials, The Bodysnatchers). Actually, there’s two guest DJs, as she’ll be joined by Nick Welsh (The Selecter, Lee Perry, Prince Buster, Laurel Aitken, Judge Dread, Skaville UK) on the decks. The night is on Friday 25th July, running from 11pm until 3am at the Komedia in Brighton, with a playlist of 60s girl pop, soul and funk embracing 60s girl groups, Motown, Ska, Soul / Northern soul, Ye-Ye, Pop, Girls in the garage, Sister funk et al. Tickets are £5 in advance (from Komedia) or £7 on the door.